You looking for things at a bargain price? You looking for a gift for yerself or a friend? At under 10 quid we look for these things all the time and then keep you in the loop about them. Rooster Bob keeps his beady eye out for yer. This site reviews items for sale every day under a tenner. See Rooster Bob's Roundup now . . . The Philips nose trimmer with precision trimming technology offers the smallest cutting element available. 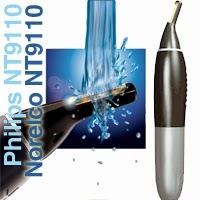 Philips offers a painless, easy to use way to remove nose and ear hair. 1 x Protection cap, 2 x Trimming comb.